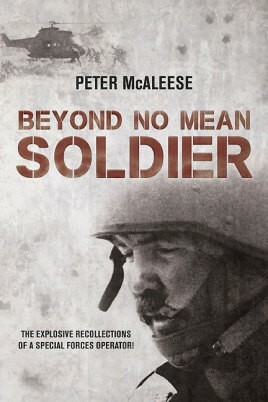 Peter McAleese needs little introduction... His classic book "No Mean Soldier" was an immediate bestseller and set the bar for the modern military memoir. Few have since met its match. This completely revised and expanded edition sees a philosophical McAleese revisiting his time with Britain's Parachute Regiment, the SAS, Rhodesia's SAS and the South African Defense Force's 44 Para Brigade. Oh, and a few other adventures in and between - Colombia, private military companies and near fatal skydiving accidents; mercenary, soldier of fortune or flawed ideologist? Now's your time to consider this and more - as has McAleese himself. It's a compelling read - and with the addition of previously unpublished photos from McAleese's private collection, there's no other way to describe it. "Beyond No Mean Soldier" does exactly that, going deep and further beyond the experience of "No Mean Soldier". Over many months and into the early hours, McAleese reflected on his wide and expansive experiences - the men he's served with and the operations he'd conducted. Here in startling detail are the Aden insurgency, covert operations with the Rhodesian SAS and one of the first ever operational HALO inserts in British military history. Heart pumping assaults on SWAPO positions with 44 Para's Pathfinder Company and the sheer terror of flawed mercenary operations in Angola with the likes of 'Colonel Callan'; near death in Colombia when an assassination attempt went terribly wrong. McAleese recounts all of this with amazing clarity and even more humility. 'I'm just an ordinary person who happened to find himself doing extraordinary things' he says. Yes, perhaps that's true to a point, but what rides through all of McAleese's narrative is his total commitment to the profession of arms - soldiering. His attention to detail, his consummate knowledge of military skills from field craft to skill at arms; airborne operations to the tactics of small unit SAS operations.... All of this echoed by the commentary of the numerous individuals that served with McAleese. From around the world, dozens have contributed perspective, commentary and reflection. "Pete does not take fools gladly and this is based upon his comprehensive combat experience where idiots will cause casualties" Alistair Mackenzie - Former 22 SAS Officer. "I managed to get myself into some very nasty but also exciting scraps while latching on to the Pathfinders to see how they were shaping up as the so-called 'Philistines'. They did excellently while under fire, proof that Peter's selection and training regime paid high dividends" Colonel Jan Breytenbach - Former Commander 44 Para Brigade Pathfinder Company, Founder 32 Battalion. These are just two of the contributions featured in "Beyond No Mean Soldier". In an age where we debate courage and leadership, it's all here. Go Beyond No Mean Soldier, it will certainly change the way you see soldiering.